Flagler College radio celebrating 25 years. SAINT AUGUSTINE – Nov. 13, several members of the Flagler College faculty will discuss the impact of World War I. The discussion and panel, titled “100 Years After the Armistice: Evaluating the Transnational Legacy of the First World War” is part of the Flagler College chapter of Phi Alpha Theta’s outreach programming. “We wanted to host an event highlighting the anniversary of the end of World War I and give a multi-disciplinary perspective on its legacy,” said Samantha Mason, student planner for the event. The panel discussion may be one of several upcoming events as the history honors society seeks to expand their outreach. The panel will feature Flagler faculty from both the history and political sciences departments. Topics include the historical memory of World War I and the impact of the Armistice on present-day politics and international relations. Panel participants include the following faculty members: Wayne Riggs, Ph.D, Rachel Cremona, Ph.D., Helmut Flackenecker, Ph.D.
Nov. 1, 1993 at 6:59 a.m., the Flagler College radio station, WFC-FM (WFCF) 88.5, broadcasted over the radio waves for the first time. 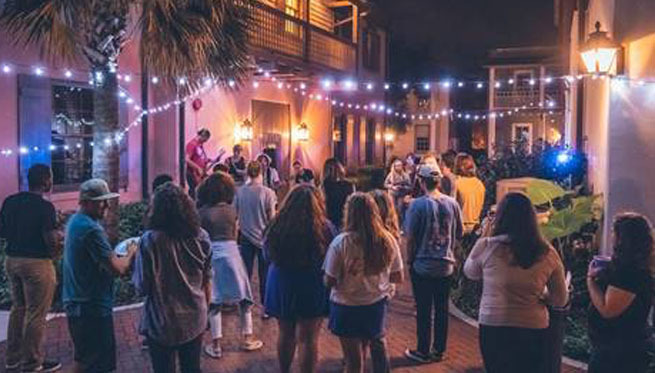 This year on Nov. 1, WFCF celebrated its 25th anniversary with a block party with Flagler College students, faculty and staff. Alongside the radio, the station’s manager, Dan McCook, also celebrated his 25 years with the college. The station prides itself on being a hub for student activity. In the 25 years on air, over 800 students and community volunteers have been involved with the station. Currently, there are more than 13 shows produced each week. If not hosting, many are writing, performing voice overs, recording and learning the ins and outs of the broadcasting industry. Playing everything from surf rock to opera, the station’s music library contains over 8,000 artists playing 24 hours a day, 365 days per year. It also serves as a Primary Emergency Alert System (EAS) broadcast facility. In 2012, the station was ranked by the Princeton Review in the top 20 of college radio stations out of 1,453.